A fraction of the companies that seek funding end up getting funded. To use some numbers, according to Fundable, 0.05% of startups are VC funded while 0.91% are angel funded. And if you’re freelancing or running agencies and shops, you may certainly be using your own funds to start and run the business. During my journey as a freelancer and startup founder, I found that funding the initial stages of new ventures and initiatives is dependent on the business execution approach as much as it is dependent on finding alternative ways to raise capital. I documented the approach that close to 100 freelancers and entrepreneurs took under limited to no budget. I gathered all the lessons learned in the Bootstrapping Summit, where I saw common patterns in mindset. There is no such thing as overnight success and yet it feels like success happened from one day to the other. Jon Sebastiani built and sold a Jerky brand for over $200 million in less than 5 years. At first sight, this sounds amazing but when you listen to the journey that led to this overnight success, you’ll find two decades of ups and downs starting and failing multiple businesses. Think of your overnight success as a 10 years project. Success is inevitable when you think about it that way. Customers will not come knocking for help. It’s your job to go find them. Many entrepreneurs and freelancers try to find the easiest ways to get clients and users for their early stage startups. Writing blog posts, running ads and spending countless hours seeking the partnership of influencers are three common approaches. But if you’re just starting and even if you’ve been in business for a while but haven’t built a product or service people are talking to each other about, your job is to go find those customers. Dave, Nisha, and the Croissant team personally reached out to every workspace in the city and sold them on the idea of Croissant, Josh Haynam pitched over 100 potential affiliates per day for them to join and promote Interact, Ash Maurya sent 1,000 emails to promote his book, I pitched over 400 entrepreneurs and freelancers the idea of the summit to get 100 to give us some of their time to share their journey, Brett Goldberg went from one office building to the other to sell corporate employees the idea of TickPick, Groupon did the same thing to validate their ideas. Go out and hand recruit your customers to build a network effect. No matter how much resources you think you need to get your idea off the ground, chances are you can do it without funding. For instance, back when a simple website cost over $40,000 to build, you had two options, either know how to build it or have that money to hire someone. Will Bunker had neither and yet, he picked up a book and got the first version of OneandOnly up and running to validate the concept and build traction. His startup eventually outperformed one of the biggest and well funded companies in the space, Match.com. Find a way to pre-sell your idea even if you’re selling freelance services. One of my first ventures was a platform that rewarded users for their eco-friendly actions. As a user, you get points for recycling. Those points could be redeemed for rewards from local and online businesses. Before creating a web or mobile app, I went to recycling facilities and partners and asked them to prepay for advertisement and exposure on the platform. I promised to promote their brand in local events and personally sell their services to a list of leads they shared with me. By following this approach, I generated over $2,000 in monthly recurring revenue before I built the product. Get savvy. You should begin any venture by planning your go to market under the condition the product is not needed yet. At that first venture, all I needed was an email address and an excel sheet to get the job done. When users recycled, they emailed me their recycling receipt and all I had to do was update their account with the new points. When they wanted to use their points, they emailed me for a confirmation code that I shared with the business they went to buy from. Try to control as many of the variables as possible. If you are a nontechnical founder building an enterprise solution, chances are you’ll have a hard time creating a product companies will trust. Unless you work with complementary skills, start with projects and startups you can impact significantly. You can also join the Bootstrapping Summit. 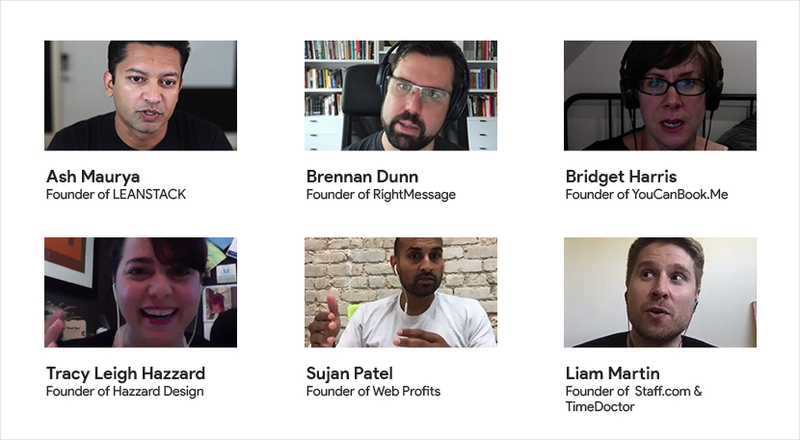 It's a virtual summit that covers the early stages of over 90 freelancers, marketers and entrepreneurs who managed to uniquely take an idea to paying customers without funding. We'll look at case studies of how to leverage partnerships other strategies to build leads. Guest writer Abdo Riani is the founder of StartupCircle.co and AspireIT. He builds products, creates programs and writes step by step guides to provide self-funded entrepreneurs and starting freelancers with the needed resources to take an idea to first paying customer/user and beyond. Find Abdo's resources here. Follow him on Twitter here.